Editor’s Note: The interview with Maritza Uzcategui was translated by her daughter-in-law, Maria Rojas. Moving her hands across the table, Maritza Uzcategui feels around for another bead. She looks forward as she patiently adds the final touches on the necklace. Smiling, she runs her fingers over the piece to feel every detail. She can not physically see the finished product but can picture it in her mind. 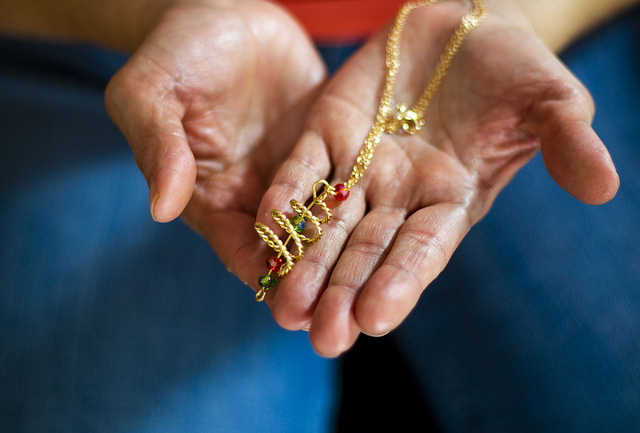 This is her process as a blind jewelry-maker — she starts in her head then creates with her hands. When 54-year-old Uzcategui lost her sight in 2009 from lupus, she had to learn how to live again. Making jewelry became a creative outlet for her to continue working with her hands. Today, she runs MU Jewels, a small family business in Denton with her son Miguel and daughter-in-law Maria Rojas. Together, Uzcategui’s family shares her story through each handcrafted piece of jewelry with the ultimate goal of helping and inspiring others. Growing up in Venezuela with her mother and two brothers, Uzcategui always found a way to be creative. Her mother’s influence on her life taught her how to be strong and work hard in everything she did. Her drive to create her childhood dream to become an architect. She studied architecture at the Central University of Venezuela and graduated in 1989. After graduating, Uzcategui worked for four years as an architect but was unable to have a good quality of life with the salary it gave her. She was taking care of her young son and decided being with him was more important, opening a couple of different businesses in Venezuela to provide for her small family. But in 1996, Uzcategui was diagnosed with lupus and everything changed. While she dealt with the unexpected diagnosis, Uzcategui started chemotherapy immediately. She gained 40 pounds in one month and lost all of her hair during the process. Her disease ultimately took her sight away in 2009 when her kidneys started to fail. She was put on dialysis and eventually had a kidney transplant but never regained her vision. Now she is 100 percent blind in her right eye and has 20/2400 vision in her left eye. She went into a year of rehab in Venezuela, where she learned how to read and write in braille. It was a very difficult transition to make at 45 years old, but it opened her eyes to what is most important in life. With her background in architecture and love for creating, Uzcategui had a desire to find a way to keep pursuing her passion even without her sight. Then she discovered the art of making jewelry. She began to search for a teacher in Venezuela who would patiently help her learn the techniques behind the jewelry process, which she eventually found. In 2016 Uzcategui moved to Denton so she could be closer to her family. They all live and run MU Jewels together. Now that they both live and work together, her daughter-in-law Martiza Rojas experiences the inspiration of Uzcategui’s life every day. Each member of their family has important roles within the business and their household. Uzcategui creates the jewelry for MU Jewels, while her son and Rojas help her with her Etsy shop. They also help set up the business booth at the Denton Community Market every Saturday. One of Uzcategui’s customers, Shea Mallett, is a trained metalsmith from UNT who also has a special connection to Uzcategui — she lost her vision in her right eye as a child. Being a source of inspiration for others who are going through a difficult time is a big motivation for Uzcategui. This was a very moving story. Well done. It would be daunting having to relearn like that so late in life.